Perhaps a tad ‘dramatico’ for a blog opening; however, in this case, I really feel that my ‘something difficult’ is the 106 degree heat mixed with humidity in Brooklyn, and my obligation, to return to it….and sweat. It has been a little over a year since we were married. A whole year! To mark the occasion, we decided to get ourselves a car, pack it up , throw in the dog, and head up to a cute riverside cabin in the Catskills. In order to get from Brooklyn to the Catskills, you must enter and drive up through New Jersey. Google maps kindly told us to hop across Lower Manhattan, head through the Holland Tunnel and zip up the 87 to Woodstock. What Google maps didn’t tell us, was that only total and utter morons try to drive through Lower Manhattan on a Saturday. Lesson sorely learnt. So, a good two hours into our journey, when we were just about approaching the Holland Tunnel and still sweltering in Soho heat; my husband handed me a gift for our anniversary. A new camera!! Wondrous joy filled the car… and I didn’t care how long it took from there on in.. as I could document the whole thing on my brand new Canon EOS. 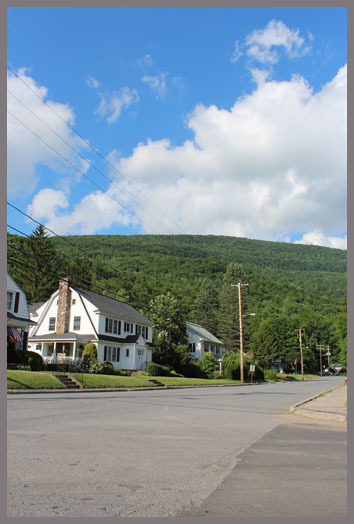 The Catskills are a large area in the Southeastern part of New York. They comprise many different terrians, including round forested mountains, narrow winding valleys and idyllic rushing rivers and streams. The area attracts many painters, artists, writers and muscians for retreats from the city and to regain inspiration. This is especially apparent in the town of Woodstock, world renowned for the 1969 festival, which actually took place nowhere near there at all. We arrived far later than we had planned, but still managed to soak in a little of the evening sun as we sat down by the river, cold beer in hand – watching the dog frolick around to her hearts content. We had found our home for the weekend on Airbnb. If you’ve not yet tried it… it’s a fantastic way to stay in all sorts of places, all over the world. A delightful little place, full of country charm and surrounded by lush green gardens and filled with the sound of the nearby stream. Our host was amazingly welcome and wonderful. Stephanie Barnes, designer of all things delightful and delicious, for the home and the wardrobe. 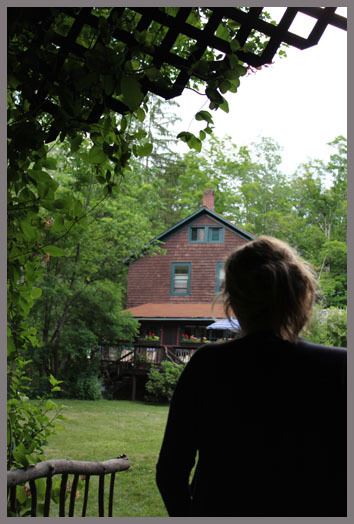 Her streamside cabin, in Chichester, (Phonecia), NY, is full of trinkets, cool old crockery and has an air of ‘yesteryear’ about it, and yet, it’s timeless. I think the most amazing thing about the place, was how at home Stephanie made us feel. Her vast green garden separates the cabin and her house, and she was perfectly happy to let our never exhausted Australian Kelpie run backwards and forwards all evening. Phonecia itself doesn’t really have much in the way of amenities if you want to cook for yourself, or do anything fancy. A trip to the local shop only revealed a sweltering bag of old lettuce and a few tomatoes covered in flies. There is however a great little pub, a pizza restaurant, a deli and a wine shop. (Deli and wine shop available only to those who have the courtesy to arrive at their destination at a normal hour). We made the short drive to nearby Boiceville to pick up a few provisions of salad, bread, and cheese, and picnicked on our own deck. Bliss. When we fell into bed, we were both happy to be out of the city, and calmed by the comfort of the huge bed, once described by another guest as a cloud! The sounds of the stream gently eased us into a deep countryside sleep. Being in the Catskills for the weekend, we noticed there is a definite lure for a ‘type’. Two types to be exact. The walker/hiker outdoorsy person, and the artist/writer indoorsy person. Luckily, I’m both! Hiking has not been a part of my life since I completed my Gold Duke of Edinburgh Award, after a 50 mile hike through the Lake District in England. I’m not sure the word ‘hiking’ has ever been a part of my husband’s life …. let alone the activity itself. 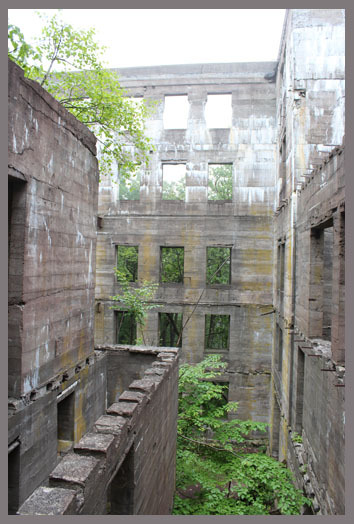 Still, we were advised of a beautiful 5 mile hike up Overlook Mountain, where there is an old hotel ruin on the way, and a wonderful view at the top. The walk up was not really what you would call idyllic, but it was definitely a walk. The hotel ruin really was something else. It was magical, eerie and quite captivating. I would highly recommend it. Sadly, due to the dense mist on the mountain, the view was nothing special..well, nothing at all really. Just a haze of white. Woodstock itself, although not ever the home to the festival, is what Glastonbury is to England, or Byron to Australia. It’s a town of colourful shops, colourful people, a cute little flea market and fabulous vegan food. If none of those things tickle your fancy, it may not be for you. Some of the locals looked like they turned up thirty years ago, in their tie – dye and dreadlocks, ready to party, and never left. Supposedly only two hours North of NYC…I guess for those who are sensible enough to plan their journey correctly, this area of the States is a fabulous little weekend getaway. I really think it does have something for all, even if you have to open your mind a little to a bit of tough walking, or a bit of soul searching…. you never know, you might just actually enjoy it. And if none of those things really are what you want… there is always Bread Alone….. created and baked in the Catskills… the most wonderful array of organic local breads.